The 6th National Agricultural Congress (NAC) is held on the 7th and 8th of September at the Taipei International Convention Center. More than 300 experts from the industry, academia, and government attended the event to devise future policies for our nation’s agriculture. 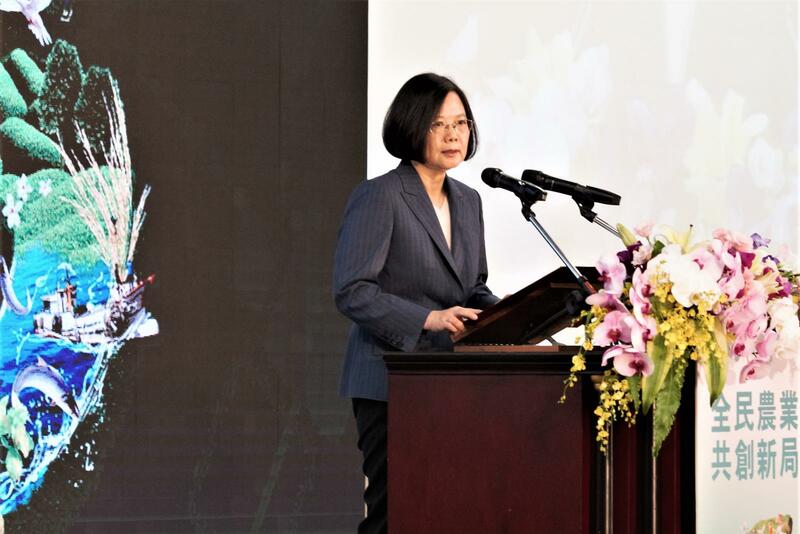 President Tsai praised the achievement of the New agriculture Innovation Promotion Program in her opening remarks, and called for the participants’ joint effort in creating a better future for our nation’s agriculture. President Tsai said that agriculture’s function is not just production; it must also cover food security, industry development, environmental protection, and rural culture preservation. She added that after a 2-year implementation, the New Agriculture Innovation Promotion Program has already achieved some groundbreaking progresses such as improving 3 major farmer welfare systems including implementation of the so called “Producer - Farmland Detachment” measure which incorporates people actually engaged in farming into the Farmer Health Insurance scheme, and launch Farmer Occupational Injury Insurance as well as agricultural insurance to secure fundamental protection for farmers and their revenue. As for the maintenance of agricultural resource sustainability and utilization, a nation-wide survey of all available farmland and agricultural resources was conducted to ensure that farmlands are used for the right purpose. Other achievements include the promotion of Green Environmental Payment and the promulgation of Organic Agriculture Promotion Act which induces agricultural production transformation and ensures environmental sustainability. There are many policy milestones in the development of Taiwan’s agriculture. Furthermore, to elevate agricultural water resource utilization and promote the restructuring of Irrigation Association, the authorities would extend jurisdiction to 370,000 hectares of farmlands outside irrigation zones so that the farmers’right to water usage can be ensured. President Tsai pointed out that in order to revitalize rural villages, the government has ordered the establishment of Agricultural Human Resource teams, Mechanized Farming teams, and Agriculture Service teams to actively solve the problem of labor shortage. In 10 years, the government plans to recruit more than 30,000 youths to work in agriculture, and at the same time, create a brighter future for Taiwan’s agriculture by encouraging farmers to pass on their experiences to the younger generation. On the other hand, the promotion of “Four labels and One QR Code” program has now reached 3,500 schools and has benefitted 1,860,000 school children nation-wide so far. Furthermore, the armed forces have also adopted certified domestic produce for their food supplements. All the abovementioned policies are responsible for moving Taiwan’s agriculture forward towards innovation, sustainability, and upgrade. The President called for the NAC and its participants’ joint effort in enhancing farmers retirement system, reinforcing food safety management, establishing specialized rural village development agency, developing agriproduct cold chain logistics system, solving production and sales channel problems. Thus, setting Taiwan’s agriculture on a new position, further creating a better future for our nation’s agriculture. The COA stated that this edition of NAC’s central motto is: “Creating a New Agriculture for All ”. The public can obtain information and participate in the NAC through its official website, which offers all the NAC’s conference data and live video feeds. More than 420.000 visitors have already visited the site. Furthermore, to put into effect the initiative of public involvement in government policies, the COA has been harvesting public opinion through various channels including on-line public involvement, local assembly conferences, and focus discussion meetings among others. Public reception has been positive towards these activities since more than 10.000 people have already participated and yielded more than 1.000 suggestions. Based on these suggestions, experts from the industry, academia, and government have discussed and debated over 12 meetings where 141 productive suggestions and 123 key issues have been singled out, which in turn became the key discussion topics of this edition of NAC. The COA Minister is scheduled to deliver a concluding report on the last day of the event where a future development blueprint for Taiwan’s agriculture will be revealed. For all those who are interested in the issue can visit the 6th NAC’s official website at https://open6.coa.gov.tw , or watch live the complete NAC events and conferences through COA’s official Facebook fan page. The COA stated that in this two-day event, issues such as: Safety (enhance agriproduct safety system, and promote excellent agricultural production and consumption), Sustainability (agricultural resource and environment protection, ensure sustainable agriculture development), Prospect (employ smart technology to adjust industry structure, comprehensively elevate agricultural competitiveness), and Happiness (complete farmer income protection, create new rural communities suitablefor living and working would be thoroughly discussed. Preliminary headings for future agricultural policies will also be proposed to maintain a continuous reform pace and to fortify industry structure, for a sustainable new agriculture.